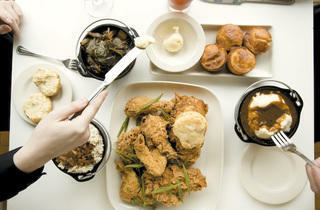 Introducing the best new midday meal in Chicago. And now, a note about the best new lunch in Chicago. Yes, you read that right: The Boarding House lunch at Big Jones is, without question, the best addition to Chicago’s lunch scene since the midday beer was relegalized. It is also one of the best values. 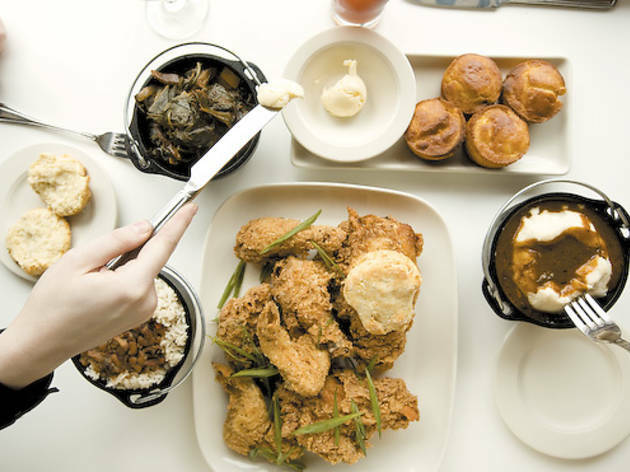 For $16 per person, the table is filled with warm corn muffins, mind-boggingly good lard biscuits, spicy greens, mashed butter (with a little potato thrown in), rice and beans and a pile of terrifically crunchy, unfathomably juicy fried chicken. That chicken comes from a classic Edna Lewis recipe and, indeed, eating this way does feel a little like traveling back in time (and geographically South). In that respect, the meal’s ending, a slice of pie (it was sweet-potato pie when I had it; usually it’s apple) is a little out of place—it’s plated in a contemporary fashion, which shocks the system back into the present. But don’t worry. Unless you are the heartiest of eaters, you’ll carry some chicken and sides out the door with you, a snack for later when you want to return to the good old days. Available Mon–Fri, 11am–3pm. 5347 N Clark St (773-275-5725).